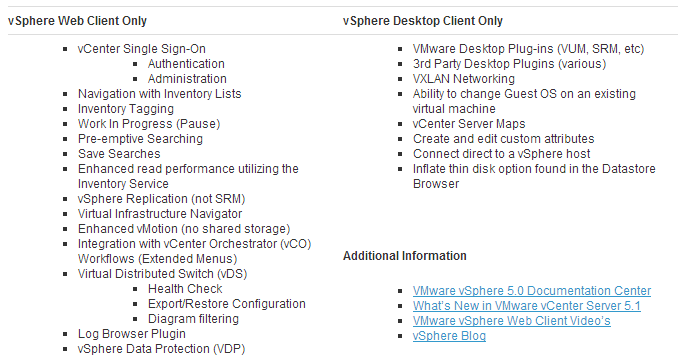 Which vSphere client should I use and when? Here's an informal, head-to-head speed test. To help understand the functionality of each client, below lists the new features that are only available via the web client and several features that remain available only in the desktop client. Well, that chart is a bit confusing, and tough to remember. 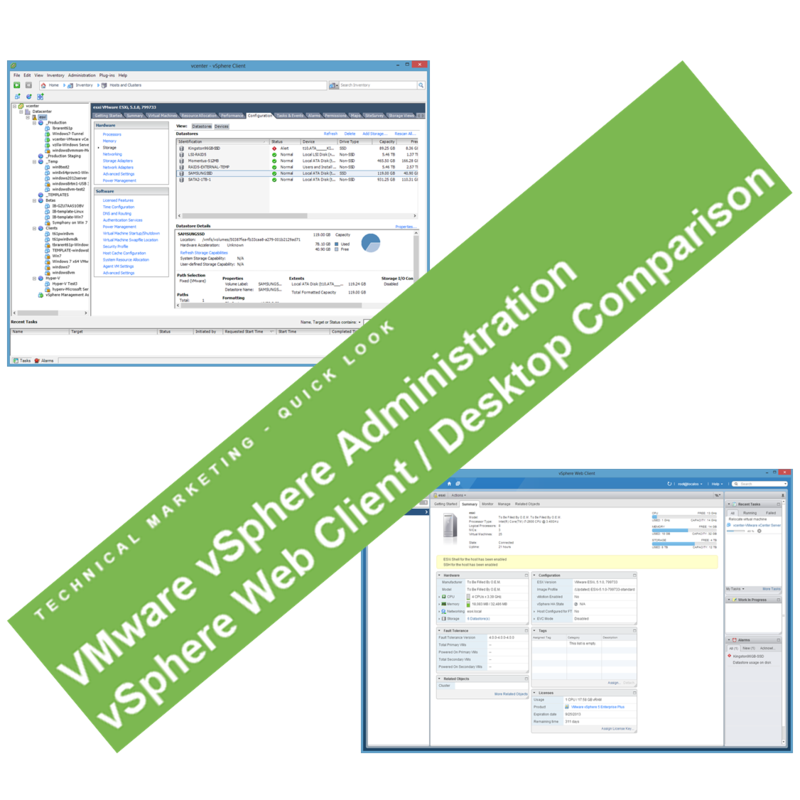 What's not confusing is that the vSphere web client is the way VMware is headed for VMware vSphere infrastructure management. Full steam ahead. Just look at Duncan Epping's posts here. Not subtle. In its initial release, the vSphere Web Client provides a Web interface replacement. Future releases will build upon this support, eventually becoming the primary client platform. We get it. So, I've recorded a little video, showing a little head-to-head battle between the clients, with the vCenter appliance running on a Samsung 830 SSD, on the local gigabit network. This will give you some idea of the look and feel differences, and the performance. Guess we better get used to it! Sysadmins are apparently expected to use 2 clients for 5.1, at least for 2012-2013 anyway. This test was in my small home lab, with 1 ESXi 5.1 host on an Intel Core i7, with 32GB of RAM, and a half dozen VMs running and about 25 in inventory total. See vZilla for details. The web client is slower, at least with Chrome 23, IE 10, and Firefox 16 running under Windows 8 Pro 64 bit. Not sure what portion of potential speed-up will be from a future, faster vCenter appliance better tuned for web clients, andor better browser plugins and/or standards support. Guess we'll have to wait and see. We should be thankful that they didn't use Adobe Flash! What's odd is that vCenter is required for the web client to work. In other words, the vSphere web client cannot log in to the ESXi host directly, as the web services aren't running on that thin hypervisor. So for that "bad day" when vCenter fails you, it would seem you'll still need the vSphere Client as your "back door" way in to ESXi admin functions. I don't know how the client experience would be affected by a different vCenter server on my same hardware. An example would be a manually configured Windows 2008 R2 64 bit instance running vCenter 5.1 and SQL Server, admittedly much more time consuming to set up. Would the two clients then be more closely matched? It seems it's probably time for me to feature the vSphere web client in my videos, going forward. Boo hisss? Hooray? Feedback below, please. I'm genuinely curious, and would love to know how folks really feel about this. Here's a raw, very rough around the edges video showing me doing a variety of informal speed tests, where I'm busy kicking the tires, using the vSphere Client we're all used to, versus Chrome, IE, and Firefox web clients.